Noor Inayat Khan was born in 1914 in Russia to an Indian Father, Hazrat Inayat Khan, and an American Mother, Ameena Begum. She was also a direct descendent of Tipu Sultan who was a renounced figure known for refusing to submit to British Rule. At a young age, Inayat Khan first lived in London until 1920 when her family moved to France which was where she got educated and she made a career in writing children’s book. When World War Two broke out in 1939, her family escaped back into England after France was taken over by the Nazi’s. Inayat Khan was a Sufi Muslim like her father which meant that she was a pacifist and believed in non-violence actions. Despite this, Noor joined the Women’s Auxiliary air force in November 1940. Later on, in 1942 she was recruited into the British Special Operations Executive as a radio operator. Her superiors had doubts about her abilities however Noor Inayat Khan still became the first female radio operator to be sent to occupied France by Britain. Under the codename ‘Madeline’, Inayat Khan sent information messages to London despite the high risk of danger. Noor Inayat Khan could speak fluent French. After a mass arrest of SOS agents by Germans, she had been offered to return back to Britain but she refused, staying in France as a secret agent. Eventually, she became one of the only wireless radio operators in France. She also became one of the most wanted British agents in France. Noor had to be strategic, moving one place to another while giving information to London and trying to avoid being captured by the Nazi’s. Most Germans had been given an in-depth description of her appearance which meant she was always on the run. In October 1942, Noor was betrayed by a Frenchwomen, Renne Garry, and was captured by the Germans. Her address was sold for 100,000 Francs. Noor was imprisoned in Gestapo H.Q at 84 Avenue Foch. She was considered to be highly dangerous despite her appearance. Going through a huge amount of interrogation, Noor refused to give away any information. Despite this brave act, she did make a mistake of having written copies of her radio transmit that the Nazi’s acquired and then used them as a way to pose as her to the British army. Inayat Khan did try to escape from Prison however her attempt was futile as she was captured. 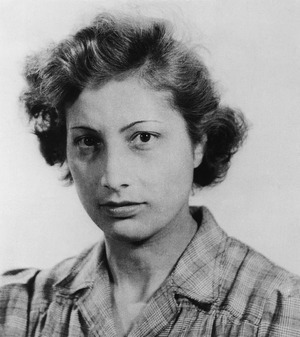 In November 1943, Noor Inayat Khan was moved to Pforzheim prison in Germany and kept in solitary confinement. She went through torture but did not give up any pieces of information. In September 1944, she was sent to Dachau concentration camp where she was shot. Her last word was ‘Liberté’. For her bravery and courage, Noor Inayat Khan was awarded the George Cross in 1949. She had all the traits of a hero, as she refused to give up pieces of information and still battled for Britain’s sake. She is a prime example of a Muslim hero. In 2012, a statue dedicated to her was constructed in Gordon Square, London which is close to where Noor Inayat Khan lived in childhood and during time away from SOS. Despite it being the first memorial made for a British Muslim Solider, it is also one of the first for an Asian woman.